This image comes from the same collection as the trench scene featured yesterday and shows three British officers of the 11th Battalion East Yorkshire Regiment (Hull Tradesmen) in their dugout at Hébuterne in December 1916. This system of trenches had been taken over from the French in the summer of 1915 and despite attacks here during the Battle of the Somme, the line had remained unchanged. Very few images exist taken inside WW1 British dugouts and this one shows it is a basic construction with solid timber supports. 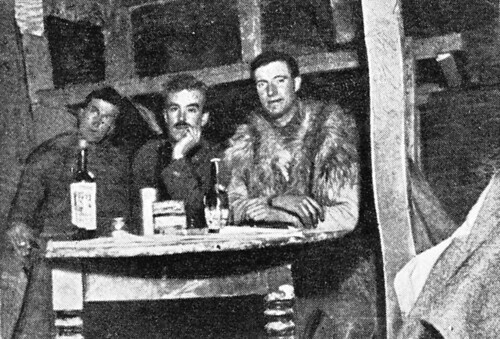 The occupants have salvaged a table from a nearby house and all are dressed for the cold; the officer on the right is wearing a goat or sheep-skin jacket, common in the winter but prone to being a breeding ground for lice. That particular officer is Second Lieutenant John ‘Jack’ Harrison. Harrison was a prominent local Hull rugby player; he had joined the Hull Pals in 1914 and served with them in Egypt and on the Somme. He would later be awarded a posthumous Victoria Cross for his bravery in the fighting at Oppy Wood on 3rd May 1917. This entry was posted on 15/12/2012 by sommecourt. It was filed under Battlefields, British Army, France, Great War, Somme, Trenches, Western Front, WW1 and was tagged with 1916, Dugout, East Yorkshire Regiment, France, Hull, Hull Pals, Somme, Victoria Cross, Winter, Winter War.